Professional career coach and resume expert Nita Busby BA MS of Resumes Etc in Placentia, California, has introduced her first e-book, "Sixteen Secrets of a Successful Resume," and hired Wordpix Solutions as the distributor of this valuable product. Finally, six reasons why a professionally prepared resume is a necessary investment. 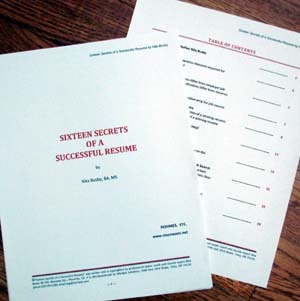 Nita Busby's "Sixteen Secrets of a Successful Resume" offers more than mere "resume preparation" and we are almost embarrassed to offer it at only $10.99*. The book covers the entire job search, with a special section about composing an impressive cover letter, as well as the creation of a great resume. "Sixteen Secrets of a Successful Resume" is distributed and sold by Wordpix Solutions, Tulsa, Oklahoma. If you're in the market for a new career or job, or know someone who is, Nita Busby's "Sixteen Secrets of a Successful Resume," with its multitude of tips for all aspects of the job search, is an essential ticket to success!